A number of school boards are considering changes to their nepotism policies due to the passage of Act 2015-486, which adopts a separate definition of nepotism for education employees, clarifying the law to account for the supervisory chains of command that are present in school systems. Jayne Williams, General Counsel for the Alabama Association of School Boards, recommends that boards not enact policies for situations that are covered by state law, such as the nepotism law. “If it’s covered by a state law, [school boards] don’t need a policy,” Williams said. In a situation that is covered by state law, whenever that law changes, the board will have to redo their policy, and some boards can get behind in adapting their policies to newly-changed laws. What those boards may want to look at, though, is those employees that may be working in situations that could be considered nepotism and whether they need to consider a change in employment structure, as there is no grandfather clause in the law. Nepotism is defined by Merriam-Webster as the unfair practice by a powerful person of giving jobs and other favors to relatives. 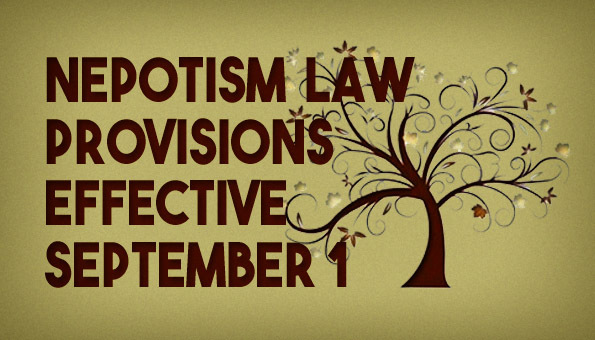 The nepotism law applies to hiring of relatives and actions related to that relative. The spouse, a dependent, an adult child or his or her spouse, a parent, a spouse’s parent, or a sibling or his or her spouse, of another person. This means husbands, wives, children, other dependents, adult children, adult children’s spouses, parents, and mothers-, fathers-, sisters-, and brothers-in law. It doesn’t prohibit relatives working in the same district, or even the same school, as long as proper barriers are erected in hiring, supervising, and evaluating those employees. Let’s look first at how the hiring process must look if a relative applies for a vacant position. If a job vacancy is posted and a relative of an “executive officer” (meaning a superintendent) submits an application or otherwise seeks the position, the superintendent cannot be further involved in any action, direct or indirect, regarding the vacancy. The superintendent must notify the chair of the board of education. The chair of the board will appoint an impartial person to conduct the interview and make a determination as to whether to recommend the person for employment. If the relative is recommended for employment, the person conducting the interview must issue a written report. The board will consider only the written report when making the hiring decision. If a job vacancy is posted and a relative of a board member submits an application or otherwise seeks the position, the board member must recuse himself from any discussion, debate, consideration, or vote on the superintendent’s recommendation regarding that vacancy. The law states “a person may not evaluate the performance of, have input into the compensation of, or otherwise set the terms and conditions of employment of a subordinate relative”. If a job vacancy is posted and a relative of a principal or other supervisor who is charged with conducting interviews, vetting or recommending candidates, or otherwise taking part in the hiring process submits an application or otherwise seeks the position, the principal or supervisor may not take any part in the hiring process, directly or indirectly, and any interviews, vetting, or recommendations must be assigned by the superintendent to another administrator in the system who does not report to the disqualified principal or supervisor. A person who is displaced for a position by a relative in any of the previously mentioned circumstances can file a civil action in circuit court within 21 days of the board’s action to fill the position. If the court finds a violation of the nepotism law has occurred, the court will declare the hiring decision null and void and the position must be advertised all over again. No person can apply for or be hired into a position where their immediate supervisor would be a relative. A person can apply for and be hired into a position where a relative would be in the applicant’s chain of command, but not the immediate supervisor. It is important to note that this is only the case if that immediate supervisor makes no recommendation, casts no vote and had no direct or indirect involvement concerning the employee’s hiring. A person is not allowed to evaluate the performance of, have input into the compensation of, or otherwise set the terms and conditions of employment of a subordinate relative. A superintendent must ask the board chair to delegate a third party to take action or make recommendations about the superintendent’s relative when it comes to evaluation and compensation decisions. Violation of the law is a misdemeanor, punishable by a fine up to $500 and/or imprisonment up to one year. In addition, both the employee and the employee’s relative will be subject to disciplinary action, which could include termination. Again, according to the AASB’s Williams, there is no grandfather clause. Therefore, if there are any questions as to whether a current employment situation violates the nepotism law, the board’s attorney should be consulted.